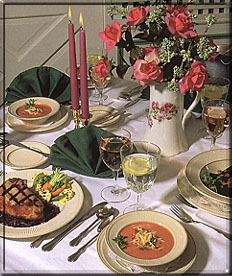 Poconos Best - The best place for information about the Pocono Mountains - cooking classes in the poconos. in the Poconos Mountains, take a cooking class together! Torte Knox Take a fun class with Chef Sheila and her staff, who have appeared on Larry King, The Food Network, and Home and Garden TV. Classes are held in a converted bank building with lots of character. This is a great bonding experience for families or romantic couples. (The family that cooks together......) Consider a class with one of the visiting TV chefs or a corporate team building retreat. A member of the James Beard Foundation. The Cooks Tour. The CIA could take some lessons here. Plan wayyyyy in advance as the courses fill up early. We tip our toques to them for saving us from having to drive to NYC to learn "The Cooking of Bologna". The city not the meat. Expand your culinary horizons with fun, hands-on cooking classes for all ages and skill levels. Choose from a wide variety of classes while you learn essential culinary techniques, knife skills and tips to last a lifetime. Watch the TV segment from NBC 10! and read Pocono Record's article featuring Chef Alice.